When I got the DIY cookbook from America’s Test Kitchen and saw this marshmallow recipe, I knew I wanted to give it a try. I’d made marshmallows once, but that was long ago when I was a teenager. It’s not really possible to make cylindrical marshmallows at home, so these don’t look exactly like commercial marshmallows. But they are really fun to make, they have a great vanilla flavor, and they’re softer and fresher tasting than the ones in the package. Now, they do call for quite a bit of gelatin, so I’m not entirely sure if they’re cheaper than commercial marshmallows. I think I used three packets of gelatin, but the recipe made an entire 9×13 pan of marshmallows, which is equivalent to at least two commercial bags. So, that doesn’t seem too crazy. If you have a good source of bulk gelatin, that would make a big difference in the price. You know, I should check my local store that has a bulk section-maybe they carry gelatin. Hmm. I wouldn’t necessarily recommend making these to cut back on your grocery bill…you should make them because they’re fun and because they taste good. And they would make kind of a fun Christmas gift, because really, how many people are going to give homemade marshmallows? 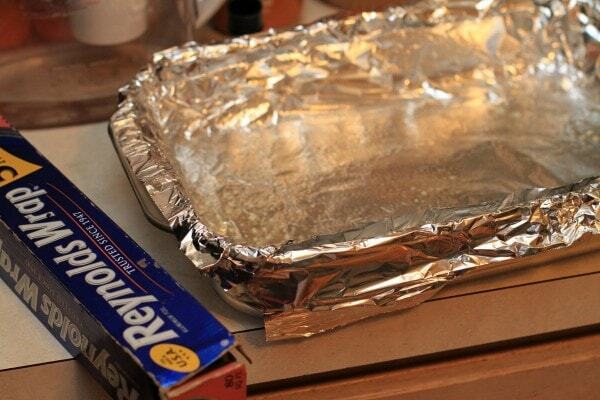 Before you get started with the actual cooking, you’ll need to line a 9×13 inch pan with aluminum foil. Use two pieces, running them in opposite directions, and pushing the foil down in the corners to make a neat lining. Then spray the foil with cooking spray. This will make it simple for you to remove the marshmallows from the pan. In a small bowl, mix together 2/3 cup confectioner’s sugar and 1/3 cup cornstarch. You’ll use this to de-stick-ify the marshmallows later. Then pour 1/2 cup of water into your mixer bowl and sprinkle 2 1/2 tablespoons of unflavored gelatin over it. I used the Knox brand. Let that sit for about 15 minutes. While the gelatin is sitting, you can make the sugar syrup. 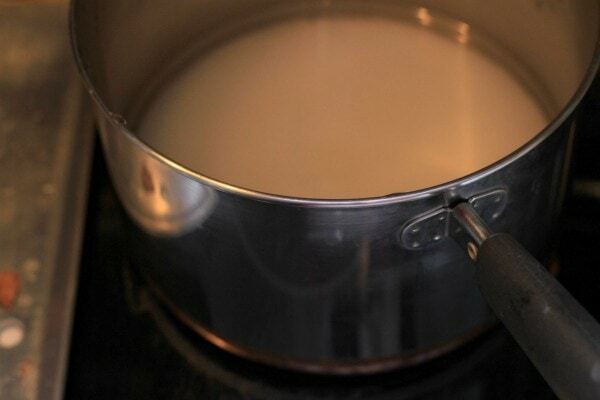 In a saucepan, combine 1/2 cup water and 2/3 cup corn syrup. Pour 2 cups of granulated sugar and 1/4 teaspoon of salt into the middle of the pan. Turn the mixer on to low speed, and pour the hot sugar mixture into the bowl with the gelatin. ATK said to avoid hitting the whisk and the bowl during this process, but I couldn’t figure out how to avoid that. And mine turned out fine. Oh. Be warned. This smells a little bit funky as it mixes, but that’s totally normal. Increase the speed bit by bit until you’ve reached high speed. Then let the mixer go for 10-12 minutes, or until the mixture is really stiff. 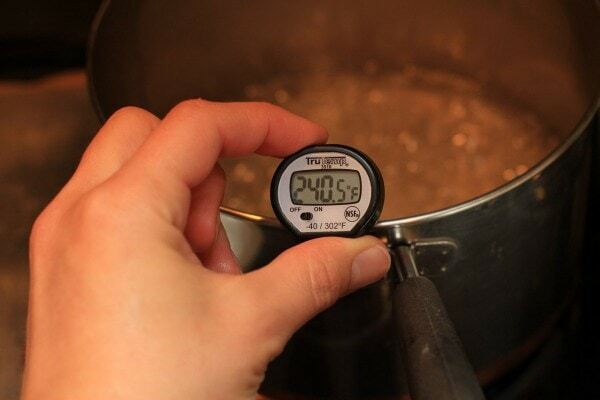 It’ll look fairly stiff after just a few minutes, so set a timer instead of just going by sight. The bowl should be just barely warm by the time you’re done. Once the ten minutes are up, you need to work fast, because the cooler the mixture gets, the trickier it is to work with. Stop the mixer, shake out the whisk really quickly, and then scrape the marshmallow mixture into your prepared pan. I used a rubber spatula to help me clean out the bowl and spread the marshmallow mixture. Don’t worry too much about cleaning out the bowl thoroughly. If you mess with that for too long, the marshmallow mixture will get too cool to spread neatly. 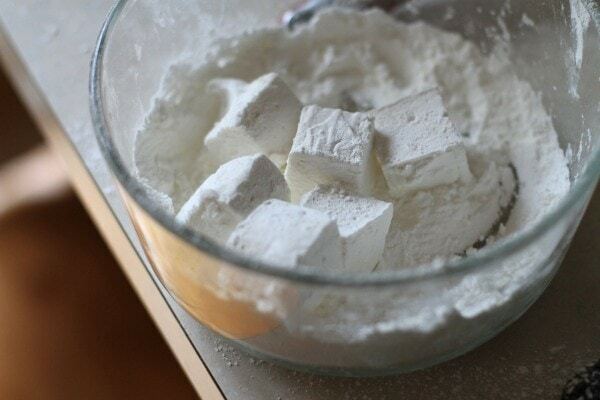 Using a small sieve, sprinkle 2 tablespoons of the confectioner’s sugar mixture over top of the marshmallows. Let them cool thoroughly, then cover them and let ’em sit overnight. The next day, lightly dust a cutting board with the confectioner’s sugar mixture, and spray a chef’s knife with nonstick spray. Lift the marshmallows out of the pan, invert them onto the cutting board, and sprinkle that side with more of the sugar mixture. Then, using your greased knife, cut the marshmallow slab into cubes. Place a few marshmallows into the confectioner’s sugar bowl and toss to coat. Then place the marshmallows into a strainer and gently shake to remove the excess sugar. You thinking this sounds messy? It is. But hey, powdered sugar is water-soluble, so it’s not as horrible as if you were flinging, say, bacon grease all over your counters. 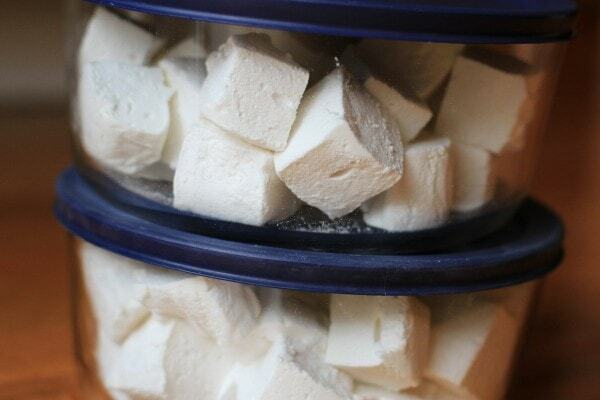 Once you’ve finished coating all of the marshmallows, store them in an airtight container. They’re pretty delicious eaten as-is, but they’re especially tasty if you eat them with a bit of chocolate. In a small bowl, mix together confectioner’s sugar and cornstarch; set aside. Line a 9×13 inch pan with two pieces of foil, running one length-wise and the other width-wise, pressing foil down into corners of pan. Spray foil with nonstick cooking spray. Pour 1/2 cup cold water into the bowl of a stand mixer, then sprinkle gelatin over water. Let stand 15 minutes. Meanwhile, in a medium saucepan, combine corn syrup and remaining 1/2 cup water. Pour granulated sugar and salt into the middle of the pan. Bring to a boil over medium heat without stirring. Cook until the mixture reaches 240 degrees°, gently swirling pan. 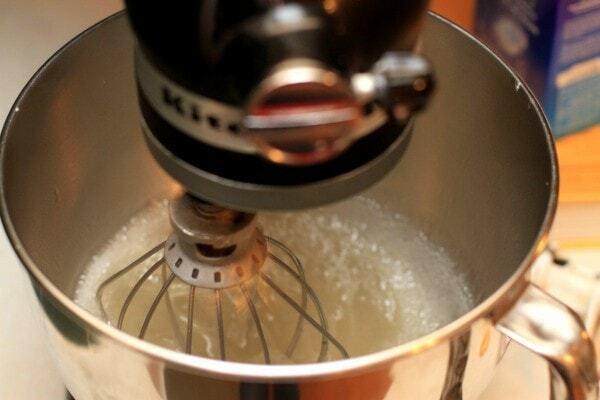 Turn mixer on low speed, and carefully pour the hot sugar mixture into the bowl. Gradually increase the mixer speed to high, and mix until mixture is very thick, about 10 minutes (the bowl should be barely warm.) Add vanilla near the end of the mixing time. Use a rubber spatula to quickly scrape marshmallow mixture into prepared pan. Spread evenly. Sprinkle with 2 tablespoons confectioner’s sugar/cornstarch mixture. Let cool thoroughly, cover, and let sit overnight. 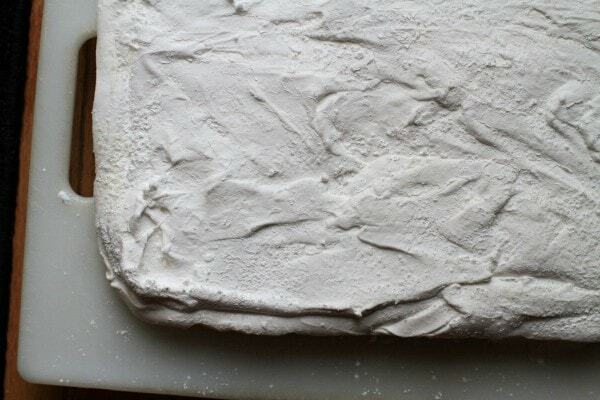 The next day, dust a cutting board with 2 tablespoons confectioner’s sugar mixture. Invert 9×13 pan onto the cutting board, peel off the foil, and dust slab with 2 tablespoons confectioner’s sugar mixture. Using a chef’s knife spray with nonstick cooking spray, cut slab into cubes. 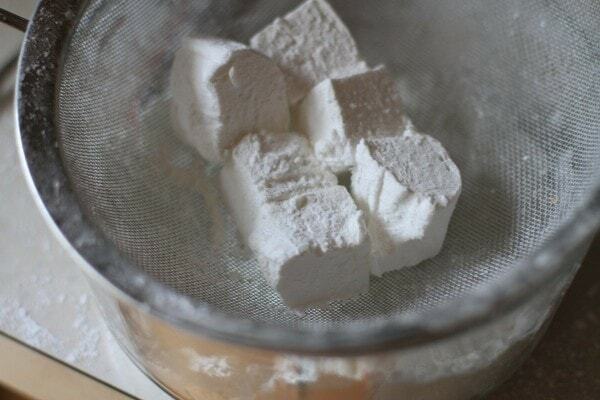 Working with several cubes at a time, toss marshmallows in confectioner’s sugar/cornstarch mixture, then shake in mesh sieve to remove excess sugar. Repeat with remaining marshmallows. We have made these! they are wonderful. And you can make round ones. Just use a cookie cutter dipped in powdered sugar and cut away. What do we do with the stuff around the edges? Cut them into bits for hot cocoa! We did follow the Martha Stewart recipe a few years back and made the snowflake shapes to give as gifts with a jar of hot cocoa. I wonder if these would work with a vegetarian gelatin substitute; does anyone know? … maybe I should give it a try and let you know! Either way … these look ah-mazing, and I haven’t had a marshmallow in years. Sadly, a direct substitution doesn’t work. I’ve tried just a direct agar substitution myself. It produced fondant instead of marshmallows. The gums and powders needed for vegetarian versions behave differently than gelatin. Most recipes I’ve seen call for a mixture of at least two thickeners (xantham gum, agar, etc.) and a more involved mixing process. If you’re thinking of something to be eaten out of hand you could look for mochi recipes. They have a marshmallow-ish texture but don’t melt. Marshmallow creame would work for hot cocoa topping but contains eggs if you’re looking for something vegan. 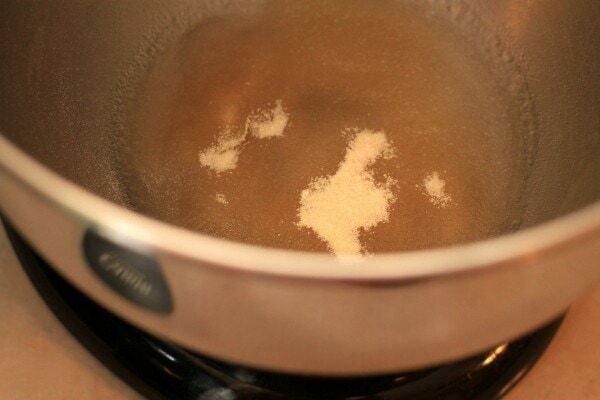 Keeping the sugar off the sides of the pot will help avoid crystallizing the melted sugar. Crystallizing means grainy marshmallows. I bet they would still taste good though! Seems pretty easy! How long will they stay good in the container? They look yum, but as a vegetarian I don’t know if I could make them because of the gelatin. I do occasionally eat things with small amounts of gelatin in them, but purposefully cooking with it seems different somehow. I think I’ve seen recipes for homemade marshmallows using agar-agar, which is vegetarian. Might be worth a look. It’s been a while, but I used to use agar agar as a substitute for gelatin when I made recipes like panna cotta. From what I recall, there are different kinds of agar agar, and it’s important to get the powdered kind and not the flaky kind or else whatever you’re making ends up with a very weird texture. Most natural food stores will have it in bulk fairly cheaply. The only tricky part is that I think you don’t use exactly the same amount of agar agar as you would if you were using gelatin, but I can’t remember if it’s more or less. Hope that helps a bit! 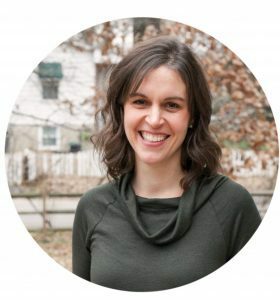 Not trying to make ANY sort of political statements, but PETA has a good page on substituting agar agar for gelatin in recipes here: http://www.peta.org/living/vegetarian-living/gelatin-alternatives.aspx. I mean…I figure they’d be a good source what with anti-animal stuff, right? They say to use equal amounts. They also suggest: “Many kosher gelatins are vegan. Try Lieber’s unflavored gel, Carmel’s unsweetened gel, KoJel’s unflavored gel, and Hain Superfruits.” Perhaps these could work too? I’ve tried an agar only substitution. It made fondant instead of marshmallows. Tasty anyway but toothachingly sweet. These are gourmet marshmallows! I bet they are much less expensive than the ones sold online. That sounds fantistic! Since I have peppermint extract I am now going to have to try and make those marshmellows! I just made these. I added 1 tsp of peppermint extract. I think that was right but my husband wanted the next batch to have a stronger flavor so I added 2 tsp. In my opinion 2 was too much it tasted like peppermint candy. You can stick a spoon in there after it has gotten fluffy but several minutes before you stop mixing and taste test it to see if you want more. But I would start with 1 tsp and maybe at the most 1 1/2 tsp. I make a similar recipe every Christmas to give with my homemade hot cocoa mix that everyone asks for. They love them! I’ve pretty much become the person who gifts food – what with my mom asking for bread and cream cheese mints along with her hot cocoa mix, and the rest of the family wants my cookie mixes, homemade vanilla extract and anything else I can cook up. 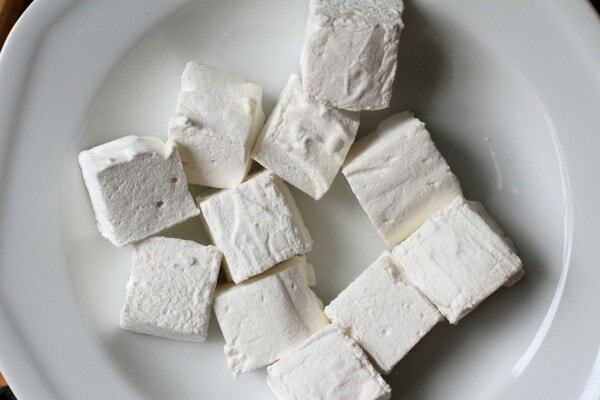 The taste of real homemade marshmallows is amazing. The taste of bought marshmallows is just a faint whisper of the actual taste of marshmallow. Fun to make. I’ve made peppermint ones, too, and swirled red food coloring through the pan with a toothpick before cutting them, to signal that peppermint flavor was added. What a great idea for a gift! i’m planning on making homemade caramels, bounty chocolaty, and chocolate truffles to give at christmas, now I have one more thing to make! Thanks! They look great btw! We have made these along with our own graham crackers for a very special s’mores night in our backyard. They are fun to make as long as you read the recipe all the way through and see that they have to sit overnight. We missed that little detail the first time! Oh well!! PS Bob’s Red Mill makes a wonderful graham flour for the homemade graham crackers and has a recipe for them. I can’t wait to try these. My son can not have artificial colors and the store marshmallows that he can have are super expensive. How long do you think these can be stored? We had ours for over a week (maybe closer to two…it makes a LOT of marshmallows) and they were just fine. 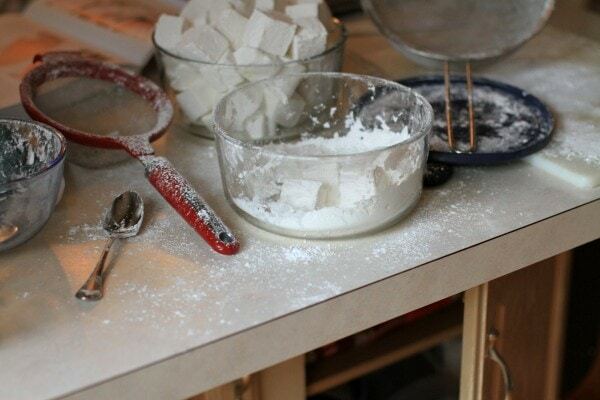 Not a marshmallow fan, so I am glad to see one kitchen mess I can skip! Homemade marshmallows melt beautifully over hot chocolate…..an experience that you won’t get with the store bought kind. These look like so much fun….thanks! I haven’t tried to make marshmallows, but for some similar things I use an oiled pizza cutter instead of a chefs knife. It works beautifully! I’ll be trying the marshmallows now, thanks! I made homemade marshmallows to give along with packets of hot cocoa for gifts this Christmas, and everyone LOVED them. I spread my marshmallow “batter” on a rimmed cookie sheet so it was thinner, and used small, about 1 inch, cookie cutters to make shapes. They were such a huge hit! I kept hearing “I’ve never seen star marshmallows before!”. I LOVE making homemade marshmallows.. then dipping them in some dark chocolate and graham cracker crumbs for an even more decadent candy. I definitely suggest an oiled pizza cutter for cutting these. It is so much easier! Hi guys. Marshmallow newbie here. How would I go about making different flavours? Would I substitute the vanilla extract or can I add to the recipe and experiment? 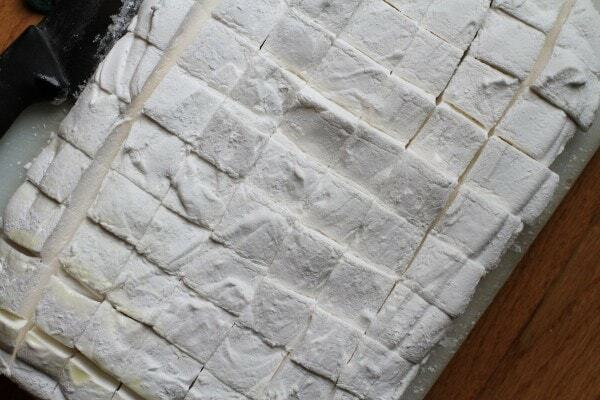 Would love to try Wild Turkey Bourbon and Cranberry marshmallows. Want to make some really bizarre flavoured marshmallows but unsure of substituting or adding. Any advice would be great! I messed up. I didn’t notice that the bottom sugar hadn’t dissolved until it was too late… now my marshmallow’s grainy.. is there anything I can do to not throw it away ? Hmm, I’m not sure. I haven’t had much experience trouble shooting marshmallows. 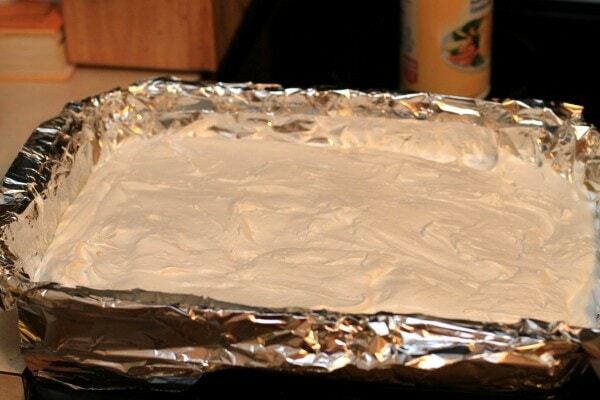 Could you use your finished marshmallows to make something like Rice Krispie treats? Maybe then the graininess wouldn’t be noticeable.